Let’s face it. 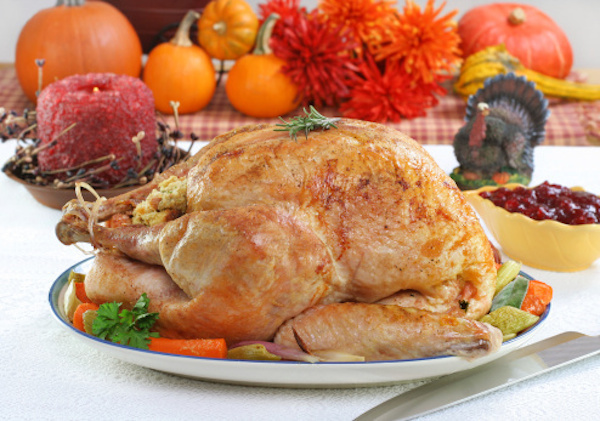 Food is a big part of Thanksgiving Day. As friends and family gather to feast on delicious culinary creations, your kitchen, quite naturally, will be on display for most of the day. So, why not extend your holiday decorations into the kitchen as well? Here are some tips for getting your kitchen ready for the big day. Obviously, you want to make sure that whatever decorations you add to your kitchen don’t get in the way of your food preparation. That is why one of the best ways to decorate your kitchen is with items that either add to or aid your organization. Thanksgiving dish towels, hot pads, and floor rugs add a festive element to your kitchen without inhibiting your ability to cook. You can also switch out your normal utensil holder with a cornucopia or a pilgrim’s hat. Another great way to decorate your kitchen is to put the food on which you have worked so hard on display. Place your food on (or in) nice serving platters, dishes, baskets and bowls, and then artfully arrange them on your counters. You can add to the Thanksgiving mood by having holiday-themed plates or by simply adding extra touches (such as ribbons on the basket) to bring in the holiday mood. You can place other decorative food items – such as corn husks, pumpkins, gourds, or acorns – in between and around the serving dishes to amp up the display. If you want to add a decorative touch throughout your entire kitchen, consider running a festive border along the backside of your countertop (where it intersects with the wall). 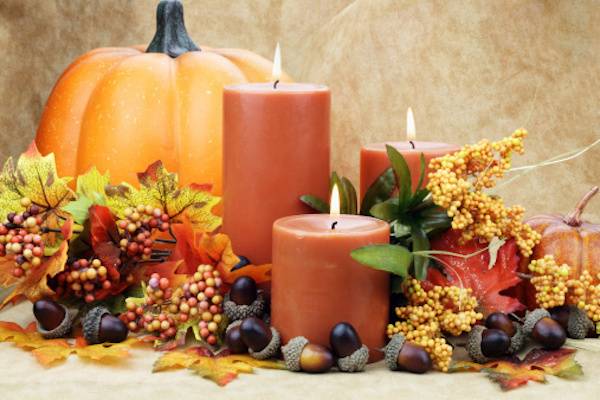 A garland of fall leaves or a line of festive candles goes a long way in adding a festive feeling to your entire kitchen without getting in the way. Lastly, when decorating your kitchen, don’t forget the extremities. If you have a door leading into the room, consider hanging a wreath. If you have space on above your cupboards, place candles, cornucopias, pilgrim hats, or other decorations on top in order to create a festive and welcoming environment. Another great place to add décor is on your windowsills. By adding a decorative touch to all these places you will create a kitchen that is inviting to all who enter while still remaining completely functional. Janine Sobeck is a freelance writer, theatre artist, travel lover, and certified foodie. She has enjoyed writing content for Accent Surfaces since 2012. There are some great tips in here! Thank you! 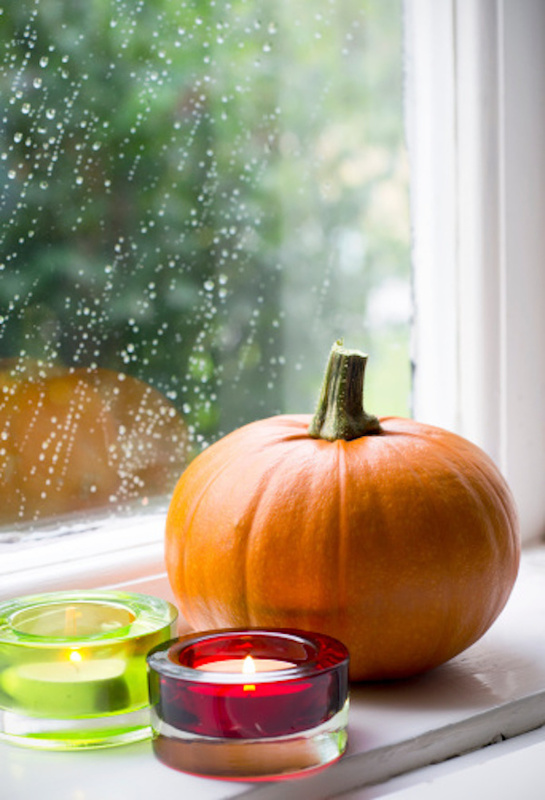 I love the pumpkin with the rain window. Beautiful picture. I agree with the advice to serve your Thanksgiving dinner on beautiful platters and in beautiful bowls. It is so much work and presentation is so important. We always focus more on the dining room and other gathering areas. Except for the festive dish towels, our kitchen gets over looked when decorating. I will be applying these kitchen decorating tips for sure! These are some great tips. Thanks so much for sharing! I wish I had a bigger kitchen so I had more room to decorate. I love to decorate for holidays and the kitchen always gets neglected. Except of course, the towels, pot holders and floor rugs. That’s all I do. Thanks for the ideas in this post. I hope you had a nice Thanksgiving. What great tips, thank you so much for sharing….